In the event that you are a patient, you may need Electroneurodiagnostic testing. These are mostly non-invasive exams conducted at a hospital or a private clinic. They may be done for many reasons such as diagnosing seizures to certain types of neuropathy. It is only a professional practice that the physician ordering the EEG explain to the patient certain things like why they are ordering the test and approximately how long the exam will take. Unfortunately many patients are not informed of anything while arriving and are often disgruntled buy the lack of disclosure. The patient should always be prudent ing in asking questions since they are dealing with their health. ▫ An EEG, Electroencephalogram is a test performed by an END or EEG technician at a hospital or clinic. It Involves the placement of approximately 22 electrodes on the scalp, spaced in 10 to 20 percent intervals in accordance to measurements of the head. These electrodes will record electrical activity that is generated mostly beneath the scalp, mainly the brain. 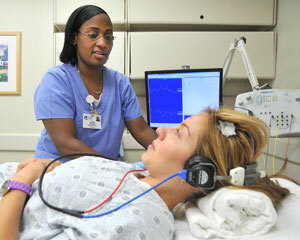 A Clinical EEG is a non invasive exam and does not involve any radiation or electricity administered to the patient. The placement of these electrodes involves the initial cleaning and abrasion of the scalp to improve the conductivity between the scalp and the electrode. This is usually done by rubbing a cotton swab dabbed in a exfoliating compound, at the site on the scalp where the electrode will be placed. The electrode is a small metal cup about 2-3 mm in diameter attached to a wire that is connected to an amplifier. The electrode cup is filled with a conductive sticky paste that adheres the electrode to the scalp. 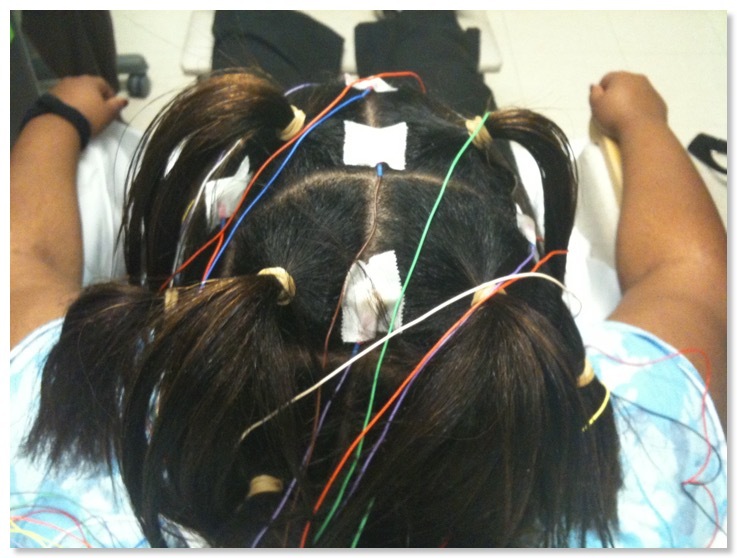 It is important for the patient to have clean hair and scalp for the exam; hence it is recommended that the Patient wash their hair and dry it before the EEG exam. It is also important that the Patient does not apply and oil, conditioner or gel after washing their hair before the Exam. The application process takes about 20 minutes. During the application the patient must remain still so the technician may properly place the electrodes and keep them in place. 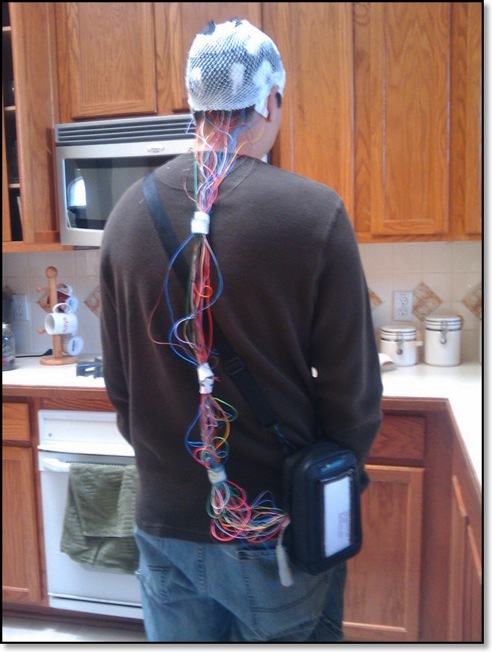 It is also important that the patient remain still during the recording process of a routine EEG. Any movement of the head is picked up by the EEG machine and overrides and interferes with the signals that are important. Poor cooperation form the patient may make information acquired from the EEG exam inaccurate or incomplete. This makes it difficult to acquire good data form certain patients such as pediatrics and the mentally challenged. Once the the electrodes are applied it is critical that the patient remain still for the recording. The recording time of a routine EEG can be anywhere form 20 minutes to 1 hour. Sensory evoked potentials (SEP) are recorded from the central nervous system following stimulation of sense organs (for example, visual evoked potentials elicited by a flashing light or changing pattern on a monitor; auditory evoked potentials by a click or tone stimulus presented through earphones) or by tactile or somatosensory evoked potential (SSEP) elicited by tactile or electrical stimulation of a sensory or mixed nerve in the periphery. Testing as and inpatient or outpatient. Electroneurodiagnostic exams such as EEG's can be performed bedside while you are staying in the hospital or as an outpatient at the hospital or private clinic. Many times this is not a choice for the patient, but if it is, conducting an exam as an outpatient such a s a controlled and isolated lab is much better. 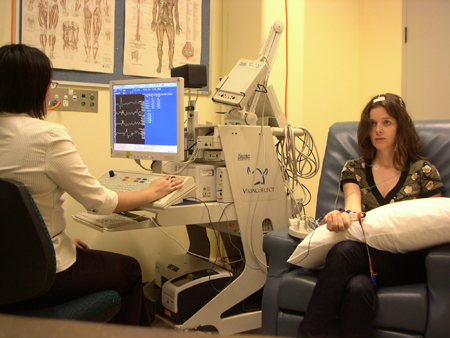 In an EEG exam, the patient must be as relaxed as possible, free of extraneous noise and distractions. Any movement of the pt head or body can be translated into false test results. It is also encouraged that the patient be allowed to be drowsy and or fall asleep during an EEG. EEGs are done on all types of patients, including some who are in altered mental status, such as confused and unable to follow commands. Recordings in a controlled lab/clinic are usually more accurate, revealing and conclusive than those tests ordered bedside in a patients hospital room.